In addition to our Guide Service we also offer half and full day corporate outings which are a great medium to treat customers as well as reward employees for a job well done. We can combine a half day on the river fly fishing trip with an instructional fly fishing school, which is a great team building event. Participants will learn the basics of fishing with a fly rod and then have the opportunity to put the learned skills to the test—–on the river!!!!!! Also, we do half and full day fishing trips. Our corporate trips can be done on public and private water depending upon the desired setting. A private setting does involve some additional expense, but provides a premium setting and experience and an opportunity to enjoy the wonderful sport of fly fishing in a beautiful place. Most half day trips will include 4-5hrs of fishing, flies,gear if needed, transportation to and from the river and lunch if desired. Full day trips include all the above, the one exception being 7-8 hrs of fishing time. Also, if you desire a private setting, our full day trips can take place on private water, which we can make available for an additional fee. Private water trips an overnight trip is also an option, and we will arrange the lodging for you. Enjoy a day on the water with us. Some of our past clients have included Heritage Concrete, General Causalty,Solvay Pharmaceuticals, Aventis Pharma,Searle, also Highwoods Properties, and VF Corporation/Wrangler, Nautica, and The North Face just to name a few. Let us help you with a trip today!!!! References available upon request. ** Some clients prefer to handle lunch and transportation on their own, for those wishing to do so that is fine. In that case the trip fee per angler is above less the transportation or lunch charges. Looking for a new idea in entertaining your groomsmen/wedding party? Take the guys out for a half day or day of fishing. Let us put together trip/ or even instructional event that will make a lasting impression for years to come. Need an activity for your special function or church retreat? We can customize/design a program ranging from an hour lesson to a 2 hour, 4 hour program or more. 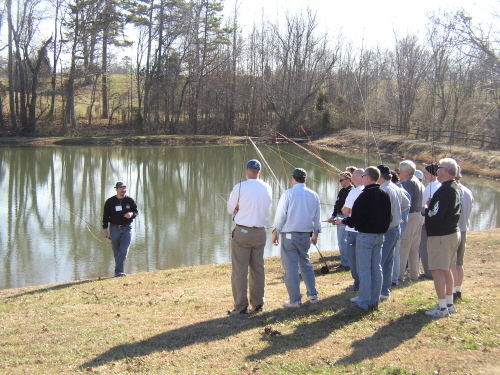 Fly Fishing is a great group activity and can be designed around a “school type of program” or a combination school/fishing outing. We can do half or full day packages!!! !